Nancy Drew is back! And now she skateboards. When I first heard that Katt Shea (Stripped to Kill, Poison Ivy) was directing a new adaptation of Nancy Drew starring Sophia Lillis, the breakout star of It, it immediately shot up on my "want to see" list. I only knew it was opening this weekend because I happened to check my theater listings. I hadn't seen a trailer, hadn't seen a TV spot, despite the fact that it's a Warner Bros. movie. Of course, the poster suggests that the studio had no interest in actually marketing this movie -- that one sheet looks less like a DTV effort than it does something for the Hallmark channel. It's almost as if they didn't know what they had. What they have is a smart, fun movie that speaks to kids on their level without insulting their intelligence with the need to be either juvenile or edgy. It's the kind of movie I want my kids to see, presenting young people who are smart and resourceful and good-hearted instead of self-entitled punks living in a world without consequences. The adults and the young people actually listen to and learn from one another, and it's refreshing to see a movie that has respect for several generations. Oh, the mystery is pretty neat, too. Based on the book of the same name by Carolyn Keene (the second volume in the long-running Nancy Drew mysteries), The Hidden Staircase casts Lillis as Nancy, a spunky 16-year old who resents having been transplanted to the small town of River Heights with her widower father (Sam Trammell). Though she means well, she's seen by much of the town as a troublemaker, causing property damage as she plays pranks as revenge against bullies. 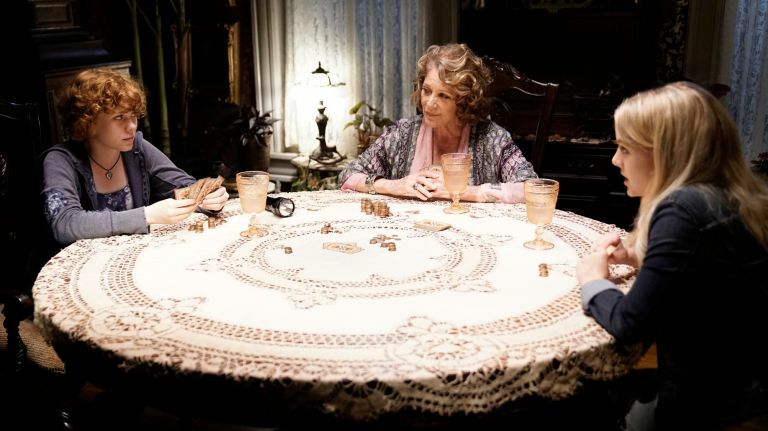 When the town sheriff ignores the claims from the eccentric old Flora (Linda Lavin) that her house is haunted, Nancy naturally takes an interest. She teams with Flora's Mean Girl niece Helen (Laura Wiggins) to investigate the hauntings and discovers town secrets and hidden agendas, et cetera, et cetera. You know how Nancy Drew do. 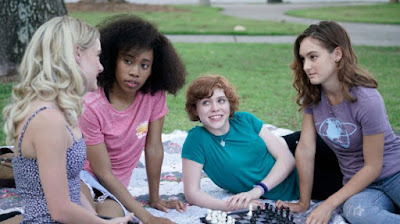 Beyond the charms of seeing a Nancy Drew mystery on screen in 2019 (even with a "hip" upgrade that includes social media and longboarding), a big part of The Hidden Staircase's draw is that it's the first real leading lady turn from Sophia Lillis. After stealing 2017's adaptation of It with her turn as young Beverly Marsh, Lillis is ready for a starring vehicle like this. 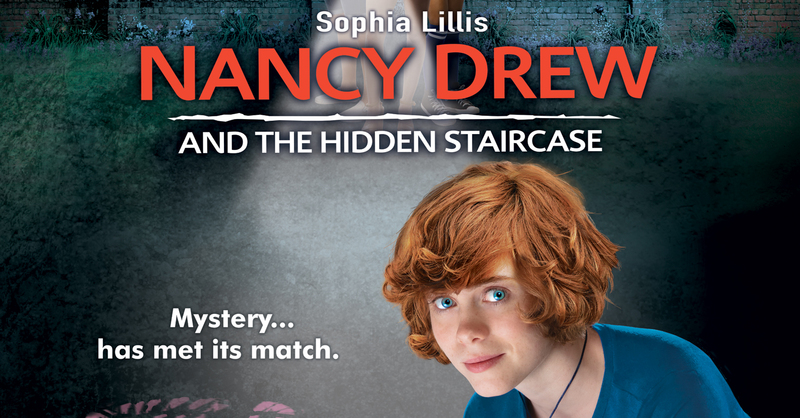 She's a terrific Nancy Drew: clever, curious, righteous, and resourceful. She doesn't do any of the young actor mugging to which we've grown so accustomed, instead embracing a sort of naturalism that feels right out of the 1970s. She has unusual patterns of delivering dialogue, always approaching her lines from a sideways angle instead of making obvious choices. The real story of Nancy Drew and the Hidden Staircase for me is the return of Katt Shea to the director's chair after two decades. Shea hasn't directed a theatrical feature since 1999's The Rage: Carrie II, or directed any films at all since the made-for-TV Sharing the Secret in 2000. I've always been a big fan of Shea as a filmmaker -- a recent revisit of her early films alongside my wife has confirmed as much -- but I'm also a fan of Shea as a person. As a student of the Roger Corman school of filmmaking, Shea knows how to make a movie that's always energetic and always entertaining, and while Nancy Drew has to be less transgressive than her usual work by virtue of the fact that it's a family film, it still has her usual focus on strong, independent female characters navigating a world of unique dangers. It's a different sort of Katt Shea movie, but it's still a Katt Shea movie. With virtually no marketing presence and Netflix-level production values, I suspect we won't be seeing another Nancy Drew mystery from Lillis and Shea, which is too bad. They make a good team. 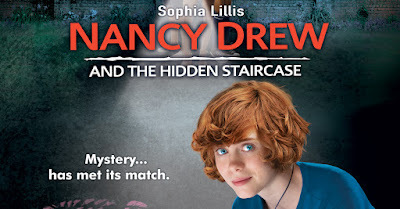 Nancy Drew and the Hidden Staircase is the kind of movie I want our daughter Rosie (6) and our son Charlie (10, who already named it his third favorite film of all time) to be seeing because it delivers the right messages in the right ways but never stops cold to be a "message" movie. It wants to entertain first and foremost. It's a special little film, so while I could see Warner Bros. sending this straight to DVD and Redbox, I'm glad they opted to at least give it a theatrical release and my family could see it on the big screen. Why they chose to more or less dump it, though, I can't say. It's a mystery. Terrific review! You captured everything about this movie that makes it special. As an AFOND (Adult Fan of Nancy Drew -- and believe me, there are PLENTY of us) I really wish this movie was getting more press. They updated Nancy Drew's setting and props, but Kat Shea and Sophia Lillis perfectly represent everything that made Nancy as a character feel special and exciting to me when I read all the books as a girl. This didn't feel like "a kids' movie with something for adults" -- it feels like "a good movie with movie-ness for everyone." I had a great time watching it as a movie-lover, not just as a Nancy Drew fan! Now I have to know -- what are Charlie's top two movies of all time? I'm guessing Saving Private Ryan and Showgirls. I know Salo and A Serbian Film are high on the list. Into the Spider-Verse is number one; Captain Marvel recently took the number two spot. His memory is short. Nice review, Patrick. I'm pretty sure this will not make it into our cinemas, but maybe it'll show up on some streaming platforms. Great review! It makes me sad that this movie pretty much got dumped with no promotion. The only reason I even knew about it was because I heard Katt Shea on shock waves. I’m kind of heartbroken for her after hearing her story, and how excited she sounded about this movie. It must be a real punch in the gut to wait 20 years between movies and then have the studio pretty much dump your movie out with no press. I can’t believe they couldn’t figure out a way to market this especially with Sophia Lillis as the lead. Reviews like this will at least help to shed a bit of light on the movie though. This is great! My wife grew up a Nancy Drew fan, and if it wasn’t for this article I wouldn’t have know this existed and that we should watch it together. Fantastic Review! Katt Shae is not only a great Director, but a great person & female role model especially in a male dominated field. She was highly respected on the ND set as proven with the brilliantly executed visions of this story. The amount of work that went in to this movie is surreal. I am VERY proud to have direct links to this movie. As to advertising, yes, there could have been much more done to put it out there. Ellen shd continue to mention it on her show every day & in Social Media Brownies, Girl Scouts & Boy Scouts would enjoy. Can someone say school field trips? Anyway, Twin Elms Rocks!!! What can I say...Defin the coolest house in town!